With an average of around 310 million monthly active users, Twitter is undeniably one of the top social media platforms in the world. When done properly Twitter can connect your business to your customers (and potential customers) and create relationships that boost both sales and customer loyalty. When done poorly it can feel like you’re just shouting into the darkness. If you’re not sure how to market your business on Twitter than this article is for you. In it we will explore how to optimize your profile for success, as well as giving you some tips on how you can get the most from your tweets. If you’re just starting out on Twitter the first thing you will have to do is pick a username (commonly referred to as a “handle”). Your handle starts with an “@” and is how you are identified on Twitter. Other users are able to tag you in their tweets using your handle. You want your handle to be easy to remember and easy to type. Handles that include number and uncommon abbreviations are harder to remember and should be avoided. You should also try to avoid any underscores or punctuation if possible. Underscores and punctuation are hidden behind the shift key on mobile phones and are therefore harder for mobile users to type. 80% of Twitter users access it using their mobile phones. These characters will therefore inconvenience the majority of Twitter users. Tweets are limited to 140 characters so the shorter you make your handle the better. The shorter your handle is the easier it will be for other users to fit into their tweets. It’s also worth pointing out that your username is not case sensitive. For instance, if your username is @JohnSmith and someone searches for @johnsmith, they will still find you. If your handle is more than one word, capitalizing each word can make it easier to read. After your handle is chosen your next step is choosing your profile and header pictures. Your profile photo (sometimes called your “avatar”) is the picture that appears beside your tweets in the timeline. This should be either your company logo or a picture of you. When choosing your profile picture keep in mind that Twitter recommends images that are 400 x 400 pixels. Your header picture is much larger (500 x 1500 pixels) and is displayed at the top of your profile. Given its size and prominent position your header picture is a great place to show off your business to other Twitter users. You should focus on high-quality images that really say something about what your business is about. If you’re looking for some inspiration, here is a list of companies with great Twitter header pictures. If your chosen images aren’t the recommended size you can use a free online image resizer like picresize.com to make them fit. For a more professional look you should have custom images sized and designed specifically for your profile. Keep in mind that your profile is a representative of your business and will be the first impression some consumers have of your business. Well designed, professional looking images can give your business a lot of credibility, poor quality images can take it away. To complete your profile you will need to add a bio and a web link. 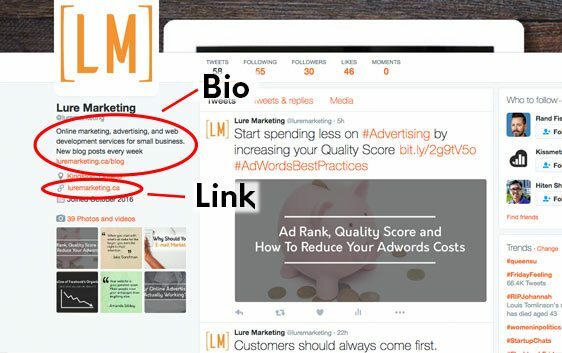 The web link you choose should largely be based around what your goals are for your new Twitter presence. If your goal is to sell more product you might consider linking to your main product page. If are looking to increase your blog traffic then your main blog page is a good place to link to. When in doubt you can’t go too wrong by simply using your homepage though. Your last step is to write your bio. This is your opportunity to sell your business to other Twitter users. Your bio is limited to 160 characters. To get the most out of the limited amount of characters it’s best to keep your sentences short and to the point. Cut out any unnecessary words, focus on your core business and try to add in a few relevant keywords. If you have extra room this is also a great place to add another link. The more opportunities you have to get users to click through to your website the better! Now that your profile is set up and optimized, it’s time to start tweeting. Here are a few tips on how to get the most out of your tweets. Hashtags can be used to reach users interested in the topic you are tweeting about. Links can take up a ton of characters. Use a free link shortener like Bitly to greatly reduce the amount of characters your links use up. Add images to your tweets. Tweets with images receive 18% more click throughs, 89% more likes, and 150% more retweets than text-only tweets. Tweet more than once per day. 500 million tweets are sent everyday. To get noticed you need to get a lot of tweets out there. Try for 2-3 per day. Post content multiple times. Only a small number of your followers will see each tweet you send. 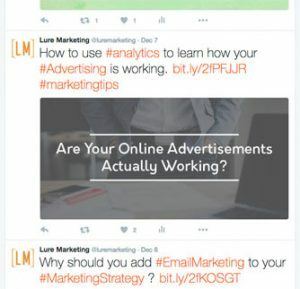 In order to get your message to your whole audience you will need to send the same tweet multiple times. Post them at different times and on different days. This will allow you to reach the widest audience. Test out different wordings. If you post about something more than once, try to change the wording each time. This allows you to see which wording is the most effective to reach your audience. Use Twitter Dashboard to schedule your tweets. It’s hard to find time to tweet more than once a day. Instead set some time aside once or twice a week to plan and compose your tweets for that week. This will allow you to focus on your Twitter strategy and better schedule your tweets. Use Twitter’s built-in analytics to optimize your results. Once a month go over your analytics data and list the tweets that got the most engagement. Make note of any similarities in the tweets that performed best. Use those notes to improve next month’s tweets! Lastly, don’t forget that Twitter is a social network. Use it to get two way conversations going with your customers. If one of your customers mention your business, thank them! If they have a question, answer it. 80% of Twitter users have mentioned a brand in a tweet. 77% of consumers feel more positive about a brand when their tweets are replied to. While some say that Twitter use is declining, it is still a major force in the social media world. Not taking advantage of the free traffic and exposure that Twitter offers is a mistake that many small businesses still make. It’s never too late to start. With a little time and effort you can start using Twitter to grow your business. Is social media marketing right for your small business? Find out with this free quiz.